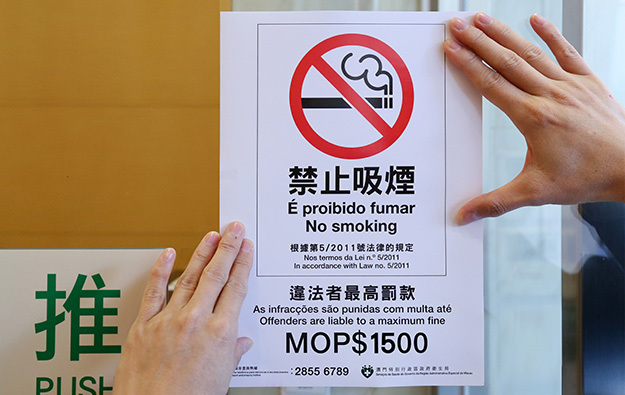 The Macau Federation of Trade Unions is said to be assisting with a petition by workers complaining local casino operator Wynn Macau Ltd has persistently broken Macau’s anti-smoking legislation. Although under Macau law labour unions and labour lobbying groups are not recognised parties to workplace disputes, the Federation itself is commonly consulted by the Macau government. The petition has been organised by people identifying themselves as employees at Wynn Palace, the casino firm’s property on Cotai. The workers have accused the venue of violating Macau’s anti-smoking regulations. The complainants are being supported by a legislator representing the Federation in the city’s Legislative Assembly . Another labour rights activist, Choi Kam Fu, director general of a grouping called the Macau Gaming Enterprise Staff’s Association, told GGRAsia in a telephone interview on Tuesday that some Wynn Palace employees alleged their employer allowed customers to smoke inside the property. Mr Choi’s association is an affiliate of the Federation. “The major issue that upset workers the most is… the situation where the company would reprehend employees who politely reminded customers not to smoke inside the [no-smoking] areas,” he said. Mr Choi said that some employees also accused Wynn Palace of allowing customers to smoke inside certain rooms that were not approved as casino-floor smoking rooms by the city’s authorities. Legislator Ella Lei Cheng I, who represents the Macau Federation of Trade Unions, said more than 100 Wynn Palace employees had already left their signatures at a collection point operating on Monday and Tuesday near to Wynn Palace. Another legislator, Leong Sun Iok, who also represents the Federation, told GGRAsia on Tuesday that the Federation would not rule out taking further action. “If the government improves its smoking control measures, then we will not take any further action. But if the government fails to make changes, then we will [respond],” he stated. Macau’s Legislative Assembly approved on July 14, 2017 a revised bill on smoking that bans tableside tobacco use in VIP rooms. Although the new rules apply from January 1, 2018, tableside smoking at VIP rooms will in effect be able to continue until January 1, 2019, as casinos have been given a year’s grace period to set up VIP smoking lounges. A dozen employees of Wynn Macau Ltd had delivered a letter to the Macau government headquarters in January, alleging the firm had been lax in its enforcement of existing smoking regulations. Wynn Macau Ltd developed and operates two properties in Macau: Wynn Macau, on the city’s peninsula, and Wynn Palace on Cotai. GGRAsia approached Wynn Macau Ltd seeking comment on the labour organisations’ claims, but had not received a reply by the time this story went online.